Corruption and a poorly planned school system prevent students from getting the education they deserve. 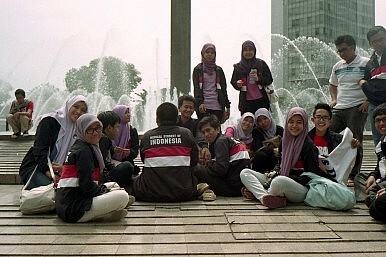 Indonesian students may be ranked the happiest in school, but according to the results of the 2012 Programme for International Student Assessment, 15-year-olds scored second from the bottom in math, science, and reading. University rankings place Indonesian universities at the bottom of their lists or don’t include them at all. For example, the Times Higher Education survey lists only three: Gajah Madah at 360 of 400, ITV at 369, and the University of Indonesia at 395. The Boston Consulting Group released a report in May 2013 noting that Indonesian companies would have trouble filling half of their entry-level positions by 2020. This is a reflection of low enrollment rates in higher education and in secondary education, which stands at 13.28 percent and 51.35 percent, respectively – far lower than the Southeast Asian averages of 27.4 percent and 65.2 percent. Although the Indonesian government is constitutionally obligated to spend 20 percent of its state budget on education, in reality it fails to do so. As a result, universities struggle to find funding for research, and those who can afford to do so choose to get their degrees overseas and come back to high paying jobs. Those who stay to obtain local degrees find themselves in low-skilled, lower wage jobs. According to a lecturer at Gadjah Mada University in Yogyakarta, Fuad Rakhman, Indonesian universities don’t have “clear recruitment strategies and procedures” and university officials are “mostly very passive and not very creative” when it comes to recruitment. Professors have no financial security and their salaries are low. Many of the country’s talent opt to teach at foreign universities or to join multinational companies. Indonesian lecturers also face a heavy class load which distracts them from research. Corruption is also rampant in the education system. In 2012 the Supreme Auditing Board found 161.5 million Australian dollars ($144 million) in accounting irregularities in the Ministry of Education’s financial reporting to 2011 out of an AUD27 billion budget. Much of the money is taken before it reaches schools, and even within schools, bribery, embezzlement and extortion is common. One mother of a schoolchild showed Voice of America a thick file filled with documents that proved that her child’s school was forcing parents to pay for services that are already financed by the state. “In Indonesia, it’s very hard to find a clean school, and very easy to find a corrupt one. One of my contacts who is a school principal even told me that there is not one school in the whole country that is not corrupt,” said Ade Wirawan, a researcher at Indonesian Corruption Watch, who estimates that 40 to 50 percent of the education budget goes missing before it reaches schools. While Indonesia’s economy is speeding up, students are continuing to fall behind and by the time they graduate, they may find themselves unable to keep up with the job market.